The explosive trend of stylistic photography apps on iOS, led by the likes of Instagram and FX Photo Studio, is making its way back to the Mac. The Iconfactory—purveyor of fine design as well as apps like Twitterrific—is among the first to take a shot; it’s introduced Flare, a tool for adding effects and style to your photos. Functionally, Flare sits comfortably between the one-tap effects apps and more powerful editors like Acorn or Pixelmator. You can drag in a photo and, with a single click, apply any of the 20 or more built-in presets that add elements like texture, fading, a black and white glow, or color saturation. You can easily snap back to the original photo if you want to start over; when you’re done, you can export your creation to Flickr, attach it to a new e-mail, or save it as a new file. You can get an idea of Flare's capabilities by checking out the photos submitted to its Flickr group. If you’re feeling creative, Flare’s Edit panel gives you more control, allowing you to stack effects and adjust how heavily they are applied. You can pile on effects like blur, color filters, and grain, then add a border to complete the scene. A snapshot system lets you save a sort of bookmark for your photo at any step of your process, and you can save your homegrown effect as a new preset for easy application to other photos. Flare is available now to Mac OS X 10.6 Snow Leopard users both in the Mac App Store and at the Flare Website. 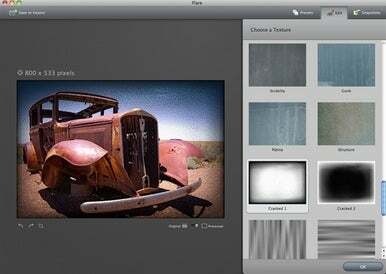 The regular price is $20, but Flare is on sale right now in the Mac App Store for just $10.